For stay-at-home parents, putting together a resume to rejoin the workforce can feel intimidating. We have tips for moms and dads with various levels of experience, including a lot, a little, and no professional background. An organized and motivated Customer Service professional with over 6 years of experience in consumer relations. Aiming to parlay my proven customer service background and communication skills to effectively fulfilling the requirements of the Assistant Customer Service Manager position. • Launched and managed successful online retail shop with an average of $10,000 of sales per month. • Marketed business through multiple channels including Internet forums, social media, and personal networks. • Facilitated customer needs in regards to questions, complaints, and product returns. • Continuously researched products & manufacturers, customer relations etiquette, and online retail community best practices. • Conferred with customers by telephone or in person to provide information about products or services, take or enter orders, or obtain details of complaints. • Directed requests and unresolved issues to appropriate departments. • Decreased customer complaints by 15% over the previous year by spearheading a new companywide SOP for the handling of merchandise returns. • Recommended improvements in products and services from firsthand customer feedback to company merchandisers. • Introduced customers to V.I.P. membership program, informing them of the annual average savings and other benefits recognized by members. Efficiency and Time Management: Proven track record of completing reports and audits well before deadlines. Management Skills: Assisted in training 3 junior accountants, monitoring their attention to detail during the first 30 days of their tenure. Awards and Recognition: Awarded “Employee of the Month” 3 times in recognition of my tireless work ethic. Relevant Job Skills: Adept at creating financial reports that follow GAAP (Generally Accepted Accounting Principles) and conducting risk analysis using FRAP (Facilitated Risk Analysis Process). Communication Skills: Excellent written and verbal skills. Proficient with various forms of electronic communication such as email, chat and VoIP applications. Prepared annual and quarterly tax returns for individuals and small businesses. Advised clients on tax related information, such as IRA accounts and charitable donations, saving individuals an average of 12% on owed taxes from previous filings. Filed extensions helping clients avoid penalties. Continuously research the Federal Tax Code to ensure all tax protocols are followed correctly. Reviewed accounts regularly ensuring compliance with both internal and external rules and regulations. Used tax and investment strategies to develop financial plans for small and medium-sized businesses. Increased sales of financial products for the business an average of 8% each quarter. Forecasted losses and earnings extremely accurately allowing the company to intelligently manage resources. When it comes to writing resumes, there’s not one perfect method to follow. The format that you eventually settle on depends upon the employment experience you had prior to your time spent raising your child or children, as well as what you were doing while at home. 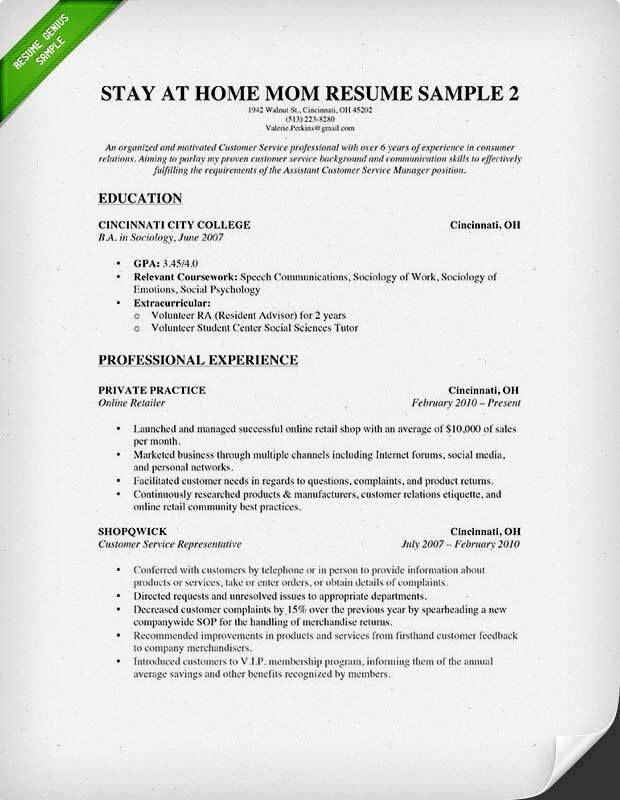 Here are a few examples of resumes for stay-at-home moms or dads with different levels of previous professional experience, to give you a better idea of how to craft your own. Choose the experience level that best matches your own to jump to the corresponding sample and writing tips. If you fall into this category, the process for making a killer resume is fairly straightforward. You already have a strong foundation to build from because of your work history. The major hurdle you face is how to address the time gap. Choosing the proper resume format can take care of this, which in this case is the combination resume. Combination resumes focus on your qualifications and relevant skills to the job you are applying to first. Those are then supported with your previous professional experience. Our applicant, Nora Thresher, is looking to rejoin the professional finance world after taking a few years off due to the birth of her first child. She opens her resume with a strong yet concise Qualifications Summary that shows why she would be a great employee before she discusses her work history. Her work history opens with the fact that she was self-employed. Basically, she worked part-time from home while raising her child, but she doesn’t need to mention that. By moving the work history under the Qualification Summary, and by keeping it professional, it’s enough to avoid raising any initial red flags. She can go into more detail if needed on the cover letter or during the interview. Even if your work experience is a little lacking, the above resume style is OK for you as well, but you have another option too. 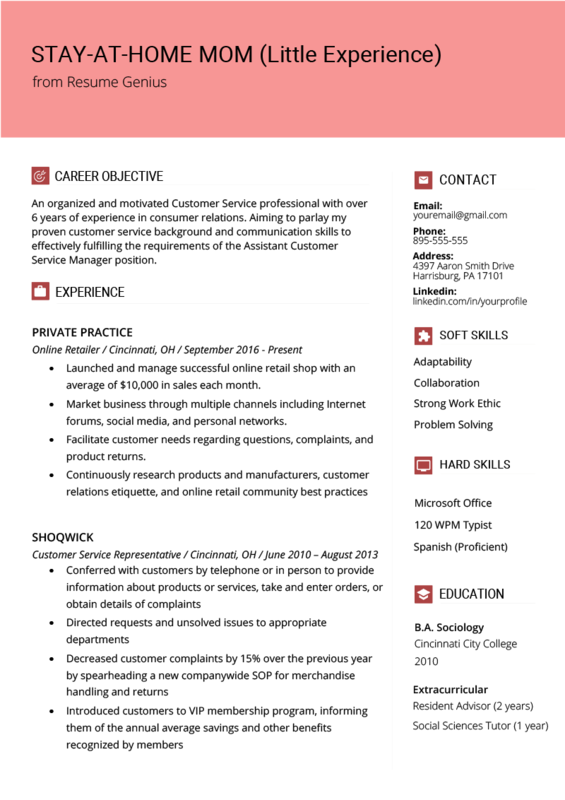 The next style of resume is even better if your education is relevant to the position for which you are applying. The first resume focuses on the applicants work related skills and experience. If yours is limited, you can instead start with your education. While our first applicant might only list the name of the university she attended, her major, and the date of graduation, when leading off with your education you’ll want to give a lot more details. This applicant, Valerie Perkins, doesn’t have enough professional experience to focus on her skills and work history. She decided to use a carefully crafted Career Objective to show why she would be a great candidate for the open Assistant Manager position followed by her education. Target your Career Objective to each specific job you’re applying for. It can be as simple as changing the position. Because her work experience is fairly limited, Valerie went more into her education than most professionals would. She listed her GPA because it was over 3.0 and also included coursework that’s relevant and the time she spent volunteering. The bottom half of her resume is where she gets into her work history. Valerie spent the last 3+ years home with her son, but she also sold baby clothes on eBay to earn some extra money. To make it sound much more professional, she phrased it just like someone who was working for a large retailer would. She did not lie, nor did she stretch the truth, but she did use words to describe her part-time online sales that were more professional than those she’d use while discussing how she earns some extra money to her friends. The most difficult of all scenarios for a stay at home parent wanting to enter the work force is when you don’t have any work experience at all. It gets even more complicated if your education is limited as well. If you have only recently graduated from high school, that is if you’re only a year or two removed, you can always use a resume similar to what a high school student with little or no experience would use. Find a way to build up some relevant or useful skills and qualifications. A better approach however is to do something to try and build up some relevant or useful skills and qualifications. Once you have something useful to put on a resume, then you can actually start worrying about fine-tuning your resume and turning into an interview grabbing machine. Volunteering: Hospitals and retirement communities are always in need of volunteers, as are many publicly funded institutions such as libraries and museums. Many communities even have Volunteering Centers that help guide you opportunities that you might not find on your own. If you’re smart about how you incorporate your volunteer work into your resume, employers will value your experience as much as any paid role. Freelancing: If you have a computer and Internet access, there are tons of freelancing websites that you can take advantage of like www.elance.com and www.freelancer.com. Do some writing, graphic design, data entry, or anything that you have the tiniest amount of knowledge with to give you something to put on a resume. Learn New Skills: Employers want to pay you for work that you do. That means you need to have something to offer them. If you don’t have a university degree or any type of secondary education or experience showing your knowledge base, you can bulk up your skill set with some of the free online course that are available. Besides the three suggestions above, anything that you can do to help give you some type of marketable skills will go a long way into helping you find a job. Don’t be too proud to take on a job that you feel is beneath you. Even putting in 6 months at a position you don’t like can help give you that little extra something that separates your resume from other former stay at home moms or dads with zero experience. So I did work in the mortgage industry from 98-2006 with a year or so in between of unemployment. However my last job was in 2006 and I have been at home with my 3 kids since then. I volunteered everyday for my youngest son’s school years in Elementary school as well as part time for his current middle school years. I was a board member for the football league he played on for a time. I also took my in-laws to and from their appointments throughout the years. 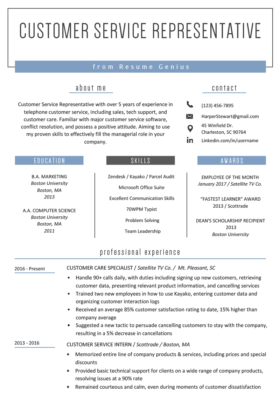 I’m now submitting my resume online and thru temp agencies but I am having no luck. Basically I have a chronological resume of my work experience and they take one look at the dates & I’m dismissed. I’m sorry I’ve been a chauffeur, a full time cook, maid, teacher, accountant, counselor, volunteer, nurse, and whatever else you want to ask I have done. I’m the last person asleep and first person awake with no paying job!!! I’m just annoyed that I can’t get looked at for nothing. I also helped out my husband from home proofreading his emails, power point slideshows, his manuals & strategies for safety regulations for Telecommunications, his contracts, helped him with his spreadsheets for P&L, as well as projected numbers/cost analysis for future work!! I mean I used to close 12-20 home loans a day with $25-$50 million a month of closings by myself. I enjoy working 12-15 hour days, coming home cooking a real meal for my husband and kids, doing laundry, helping with homework, and then working on work when kids go to bed. I need some direction before I just give up and die of boredom!!! Thanks in advance. I have been a stay at home mom for 15 years, but during that time, I graduated from law school, have moved 3 times, been on several boards, volunteered at my children’s school as well as chairing the coats for kids program for Junior League. I don’t even know where to begin. I’m not even sure what kind of j0b to look for until I take the bar exam. Its tough…I need to do something though. I want to go back to work. Eventually I would like to practice law and plan to take the february bar. Hi, First off thanks for providing this information!! I’m also a stay at home mom for the past 21 years. You’ve referred other s-a-h moms to resume examples but they all list years of employment. 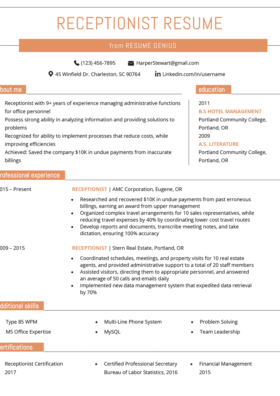 I saw the suggestions for functional format resumes but they too list experience with dates. I’m a bit perplexed as to the best way to approach my resume. Thanks! Hello! I am a stay-at-home of 1 and 1/2 years. My fiance is self employed so while at home I have assisted him with the business. Is Executive Assistant a suitable title for my position. My fiance sells cars amongst other things, so I would help him select the best cars and travel with him to pick them up, drive them, and find prospective buyers. Hi, I have been a stay at home mom for the past 15 years. I did manage to get my lpn around 2014, but havent used it due to caring for my aging parents and my own children. I also have another health care assistant certification as well as substitute teacher credit hours that permit me to work as a substitute teacher for infant and preschoolers. I am in a position now that I can work part time or per diem. What kind of resume would be best for my situation? Hello, is it necessary to list education if the highest level completed was high school? The last time I was employed was in 2005. I have an associates degree, graduated with honors, made Dean’s list, and am presently working toward my bachelors at a well known university. I have been a stay at home mom for the last 11 years, but my situation is slightly different in that my lapse in employment is directly linked to my husband having been in the military. We moved frequently, and it stopped making sense after my daughter was born for me to remain employed. At this point, I am trying to get any job available– How do I play up my experience in living a military lifestyle, and include my status as a veteran spouse without it seeming obvious? What about references on resumes? I’ve been a stay at home mom for 5 years and I haven’t kept in touch with any of my previous employers or professors. 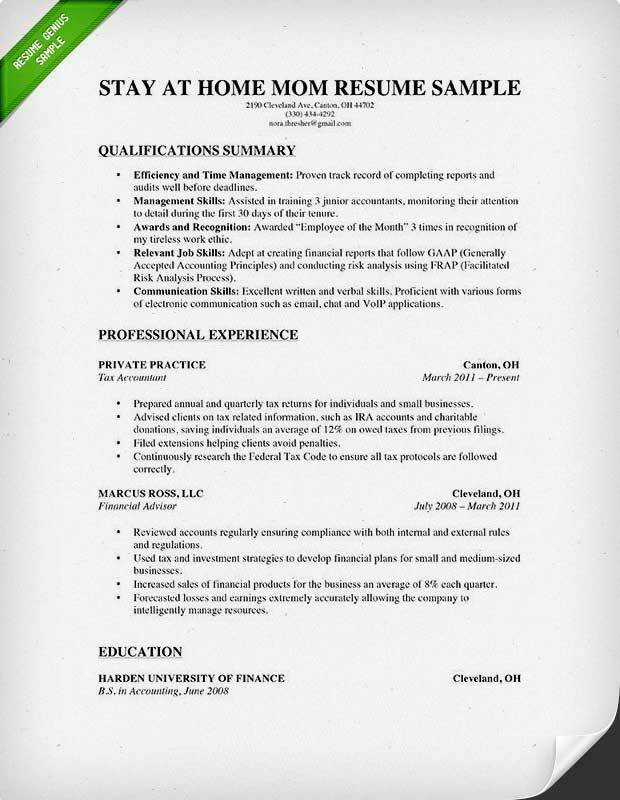 Is it ok to leave references off your resume? I feel I’m in the most impossible situation. Only have high-school diploma so don’t mind taking jobs most would consider below them. Been a stay home mom for the past 17-ish years. So long I don’t even remember the dates I worked and both businesses I worked for have since closed. Nowdays even department stores require online applications/resumes on which they ask for references. Who do I put down? I have no way of contacting anyone professional! Please help! I never got chance to work , and i am a stay at home of two with zero work experience, but now i feel i need to do something with my life , i want to work and don’t even have a resume to start with. Is it necessary for me to join some online courses before starting job hunt? I worked off and on when my kids were growing up, but I had to stop working to homeschool our youngest for medical reasons. I haven’t worked in over 15 years now. I need to go back to work now. My work experience is very out of date. 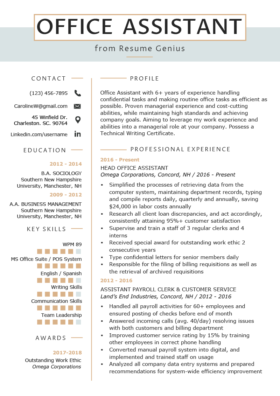 Which resume would be best for me to use. What if I worked for about 6 months as a cashier in a small store right after I graduated from high school, then I got pregnant and had to quit and now it’s been 5 years of being a stay at home mom to 3 kids. I’ve read that I should do volunteering or something, but I’ve never had time to do anything else then take care of my children and my partner. Now I have to find any job as soon as possible because my partner is unemployed and he is having a hard time finding a job. Also my high school education and my job as a cashier was in Mexico and I don’t know if an employer will even consider it. Besides cashier, I did all cleaning, stocking, pricing, worked with suppliers, inventory, I was pretty much in charge of everything. Should I list the cashier job and then just put “Stay at home parent” and the dates? I have significant volunteer work, with multiple organizations over 15 years, the first 3 years of which I also worked. How do I best show this? This includes 3 different roles as an officer on 3 different boards. So how do I account for the last 22 years I have spend as a stay-at-home parent raising a family? I have 6 years experience as an Admin Assistant (2 employers), prior to having children. I don’t feel like employers are able to get past the 22 year gap and give me an opportunity. How do I (or do I), highlight those 22 years?